The CMMI maturity level 1 to 5 is a certification for process development in IT and software industries. To achieve CMMI certification, organizations must have to design, implement and use development processes defined in CMMI maturity levels. Also they have to prepare and maintain CMMI documents confirming requirements of CMMI level 2 and CMMI level 3 standards. We offer online CMMI documentation consultancy, in which we collect required information from clients via e-mail and other digital sources and prepare CMMI documents as per their services and requirements, by using our CMMI documentation toolkit. 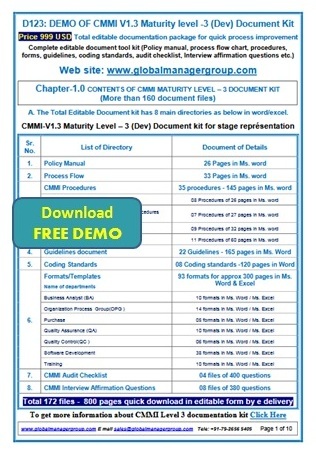 The Ready-to-use CMMI level 2 documents for IT and software companies include sample copies of CMMI process flowcharts, CMMI procedures, guideline documents, sample formats as well as ready-to-use audit checklists, etc. All the CMMI documents for level 2 are written in plain English and provided in editable word formats, which saves time and cost involved in the process of documentation, and hence, CMMI level 2 Certification. The Ready-to-use level 3 CMMI documents for IT and Software industries, include sample copy of CMMI manual, coding standard drafted and endorsed to ensure effective quality development process, CMMI procedures, reference guidelines, sample formats as well as ready to use CMMI audit checklists etc. All the CMMI documents for level 3 are written in plain English and provided in editable MS Word format, which saves time and cost in the process of documentation, and hence, certification.